In the past we’ve talked about the Kulipari series of fantasy novels for young readers, created by former NFL star Trevor Pryce. We’ve also mentioned that earlier this year the books were adapted into an 2D animated TV series running on Netflix. 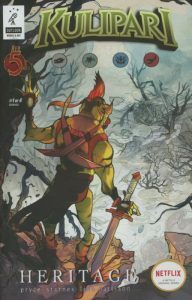 Well now the amphibian evolution continues as Red 5 Comics bring us the Kulipari: Heritage full-color miniseries (written by Mr. Pryce and Joshua Starnes, illustrated by Sonia Liao and Ronda Pattison). “Where the first season of Kulipari [the TV series] ends, Kulipari: Heritage immediately begins. Burnu, leader of the poison frogs, the protectors of the outback, has been sent on a secret mission to find the original source of the frog’s power and return it to their new homeland.” You can find the current issues at your local comic book shop, or else over at Atomic Empire. Posted in: Comic Book News, Television.